I am stuck in Grenoble now and the past week has been cold, rainy and somnolent. I miss the South of Italy! Aside from offering the exciting opportunity to wear my new electric orange Hunter rain boots, the grey weather has made it impossible to enjoy venturing outdoors. Yesterday, I could not bring myself to leave the house in search of market ingredients. Instead, I decided to make this quick risi bisi style soup, and then watch ten consecutive episodes of Downton Abby. It was just that kind of day. Meaning ‘rice and peas’ in local dialect, risi e bisi is a culinary classic throughout Venice. Rice is a staple of the Venetian diet and when you drive through the foggy marshes of the Veneto you see why. The wet climate and low swamp lands are ideal for rice growing, and also Prosecco, which you can buy on tap at gas stations throughout the region. As a devotee of Southern Italian cooking, I tend to sniff parochially when one mentions the lands to the North. But if they sell bubbly at gas stations and make risotto, my sniffing might be just a touch churlish. So I recommend you make this lovely Northern Italian dish and my Neapolitan culinary sensibilities will not be offended in the slightest! Risi e Bisi is often risotto-like in texture, but wavier or ‘all' onda’, as you would say in Italian. I prefer this dish on the wavy side, making it a true hybrid of a traditional risotto and a zuppa. 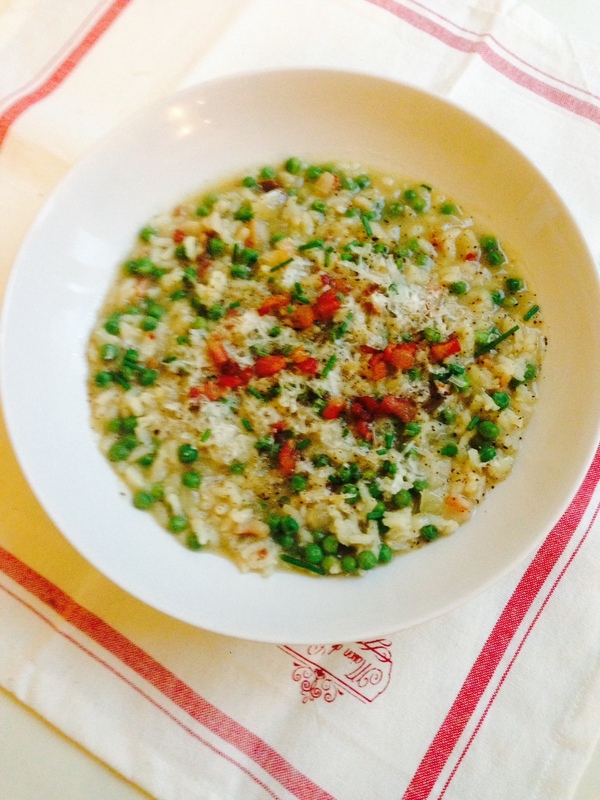 Generally risi e bisi is made in the spring when green peas are plump and at their peak. I however made it with frozen peas, because honestly, I had nothing else in the fridge, and was too preoccupied freebasing episodes of Downton Abby to leave the house. To add texture and visual appeal, I added bits of sautéed pancetta and chives. In tribute to my Venetian friends to the North, I enjoyed a glass of prosecco while preparing, and suggest you do the same. This recipe is more soup like in texture than traditional risi e bisi, if you prefer a thicker version, use one cup less chicken stock. Add pancetta and sauté until fat has rendered and pancetta is crispy and browned (about 3-5 minutes). Remove pancetta with a slotted spoon and set aside on a paper towel lined plate. Reduce heat to medium, add onions to Dutch oven and sauté until translucent but not browned (about 3 minutes). When onions are translucent, add minced garlic, stir to coat in onion / fat mixture for 1 minute. Add rice and stir to coat in onion/ fat mixture. Add cracked pepper and chicken stock, bring to a boil, then reduce to a simmer. While soup is simmering, add half of your pancetta back to the Dutch oven, stir with wooden spoon. Allow your soup to simmer for roughly 20 minutes. After your soup has simmered 20 minutes, add green peas and simmer, stirring occasionally with a wooden spoon for an additional 10 minutes. When finished simmering, add half of the Parmesan and stir. Plate your Risi e Bisi in shallow bowls, garnish with remaining Parmesan, sautéed pancetta, chives and cracked pepper.